A government press release published earlier this month – aimed more at car drivers carrying insecure loads than movers – claims 40 beds, 96 chairs, 49 cushions and 163 mattresses were found recently by Highways England Traffic Officers! The list also includes 52 sofas and 17 tables….the mind boggles! However it has prompted a campaign by Highways England entitled ‘GET YOUR LOAD HOME IN ONE PIECE – TIE IT DOWN PROPERLY’. Maybe not as catchy as it could have been. Personally I’d be inclined to call the campaign ‘Ban Flying Furniture’. The phrase ‘fly tipping’ also takes on a more apt meaning. 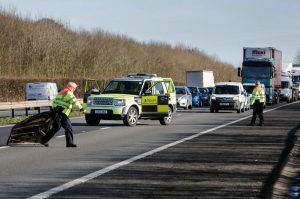 On a more serious note, Highways England said ‘Badly secured items that fall onto busy, high-speed roads are a danger that causes delays and even collisions. The average incident like this takes 20 minutes to clear up, often disrupting other road users.’ In a bid to keep the roads clear of domestic debris, Highways England has launched this campaign to encourage drivers with bulky items to make sure they are properly secure. Highways England project manager Amelia Kirwan said: “We want all drivers and their items to get home in one piece. If you’re buying or moving furniture this weekend, use proper straps that are strong enough for the job. Don’t risk losing your stuff, and causing other drivers to become delayed, injured or worse. Our traffic officers picked up around 600 items such as mattresses, sofas and chairs during a nine month period. So, before you set off, check your load is secure and your view is clear of obstructions”. Research for Highways England, which is responsible for England’s motorways and major A-roads, found that nearly 9 out of 10 cars observed did not have any method of securing heavy loads inside a vehicle. If the driver stopped or changed direction suddenly, this creates a serious risk that a load can be thrown forward through the windscreen or hit vehicle occupants. Here at the Movers & Storers Show Newsletter we wonder whether some of the more social media savvy out there could use this story to drum up some much needed business?